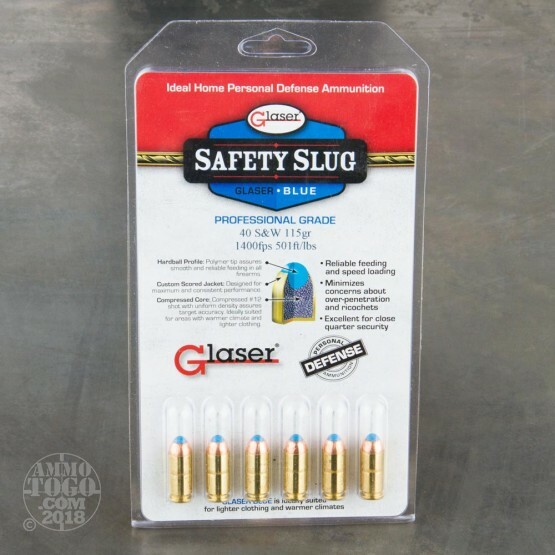 The overwhelming choice for the "house gun" stored in the nightstand, the Glaser Blue Safety Slug was originally designed for use by Sky Marshalls who needed a handgun round to use during air travel. Ideal for use as a defensive round in highly populated or urban areas, the Glaser Blue Safety Slug is constructed to provide the perfect balance between penetration and fragmentation. 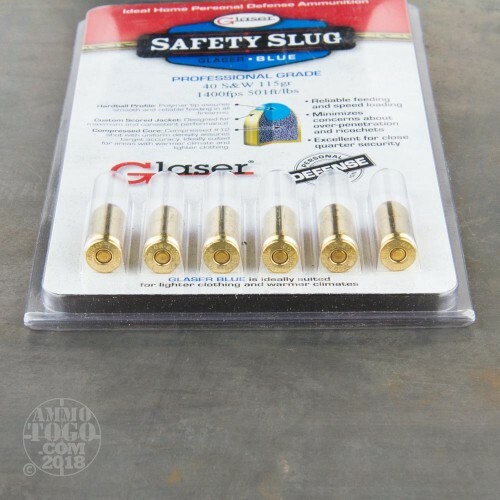 This ammunition provides a safer, more practical option for self-protection in apartment complexes or close quarter areas where ricochets off hard surfaces or over penetration of soft tissue could present a danger to innocent bystanders. Rounds that miss the intended target are more likely to break up on an interior wall, dumping energy rather than proceeding into an adjoining room, potentially injuring an innocent bystander. Each of these 40 S&W rounds is loaded with a 115 grain rifled slug projectile. These special projectiles are engineered using a thin-wall jacket and precision lead core constructed with #12 compressed shot and a soft polymer tip. Also, designed to reduce felt recoil, these loads allow for faster, more accurate, shot-to-shot recovery. With a round nose profile, these loads deliver reliable feeding, function, and extraction. This package contains 6 rounds of new production ammunition. Each round features a boxer primer and reloadable brass casing and produces a muzzle velocity of 1400 feet per second with 501 foot pounds of threat-stopping energy.